It’s not often you heard Alan Titchmarsh, Ben Fogle and Ziggy Stardust in the same breath. But Denis Donoghue explains all. Hardly a week goes by now without the emergence of another big name to inform, urge or cajole us into voting yes or no in the referendum. In the last month we’ve had David Bowie, Alan Titchmarsh, Ben Fogle and Eddie Izzard popping up to champion the status quo. While for the Yes camp we’ve seen Will Self, Mairi Hedderwick, Billy Bragg and Ricky Ross joining the likes of Irvine Welsh, Pat Kane, Brian Cox and Mogwai’s Stuart Braithwaite. Who cares about what celebrities think? You do obviously. And so do the campaigns. But why? Well, in my opinion, there are several, sometimes overlapping reasons why we take more notice of what ‘celebrities’ think. Oh! You pretty things: We admire celebrities, we like what they do and respect them for their work. They have achieved something and this gives them a platform from which to be noticed. We could be heroes: Celebrities are not a new invention. Heroes, both mythical and real, have existed since the dawn of civilization. We want to be like them and view them as role models of sorts. Psychologists tell us that in our long-standing hierarchical society we always look to copy the behaviours of ‘higher status’ figures. Ch-ch-ch-changes: They tend to be different. They are more varied, colourful and multi-dimensional than politicians. They might also offer a different perspective or communicate a message in a way that we can understand better. If you say run, I’ll run with you: We can relate to celebrities more readily and perhaps share their background or journey towards forming a standpoint. So how is this playing out in the independence debate? What, if any, difference is celebrity involvement making? Well, that depends. It all comes down to the level of ‘penetration’ that their message gets and on how much weight voters attach to it. The coverage they get is often down to the vagaries of the mainstream media. But the level of weight, I would suggest, comes down to a combination of factors: status, coverage, message, connection and engagement. For coverage there is little doubt that David Bowie’s intervention has been the highest profile one. He’s arguably one of only a couple of dozen genuine ‘Legends’ in the music industry and his intervention (albeit second-hand) came live on TV during a high profile Awards ceremony. Because of this it was picked up by the media and made the news bulletins and front pages the next day. The other No side interventions have also received a reasonable level of mainstream coverage; particularly in the UK printed press. Being generous, this may be because celebrity endorsements of the No campaign are much less frequent, and perhaps, of themselves more newsworthy than those on the pro-independence side. Perhaps. Aside from the fact that only Bowie failed to use the P word; they all have a startlingly similar tenor. And, on the face of it, there appears to be little substance to these interventions, or pleas as they might more accurately be described. Scratching a little further (where possible) Titchmarsh asserts that a Yes vote would be a mistake and bases his plea around pride and not wanting to see barriers being put up in the UK. Fogle also highlights pride and adds that: “both England and Scotland will suffer from a break-up of the union. There will be increased costs, as well as social and political pressures on both sides at a time when we are trying to get out of deficit.” There is little recognition, however, that these barriers and costs are within the power of the UK Government to address and that it is their lack of willingness to pre-negotiate that creates them. Britain (the island) will still be Britain after independence, and it will still take me about 8 hours to visit my relatives in Devon. For those who have a British identity there is no reason why this should change if Scotland opts to govern itself. Multiple identities are commonplace among those born elsewhere or brought up within a minority culture in Scotland. On his second point there is clearly a serious lack of understanding about Scotland and about the independence debate. Presumably he has not seen the rictus smile of Nigel Farage on his television screen or looked at UKIP’s current poll ratings. Perhaps the Home Office’s Go Home vans did not visit his part of the “vibrant, tolerant, diverse, confident, country” of Britain. If he had bothered to do even a modest amount of research into the Yes campaign he would acknowledge there has been no ethnic angle to it. “Alex Salmond’s separatist nationalism” is avowedly pro-immigration, while the Westminster parties are falling over themselves to out-Farage each other. Bowie has not elaborated upon his intervention with any substantiated argument. So, on the face of it, a lack of understanding about Scotland and the nature of the debate seriously undermines the value of these interventions. None of them touches upon issues of governance, democracy or equality which are the core pillars of the Yes campaign for the most part. The level of understanding of the issues is perhaps a result of the nature of connection and engagement that these individuals have with Scotland and the Scots. But these are things that should not be confused with ethnicity or residency. Fogle has stated somewhat apologetically that: “as an Englishman, I don’t get a vote, but with a proud Scottish grandfather and relatives in Scotland, I can’t help but have an opinion.” Of course, you can have an opinion, Ben. And Englishmen (and women) do get a vote if they live in Scotland. The referendum will affect the whole of the UK and we need more English people engaging with it and thinking through the implications for England and the rest of the UK. Indeed there have been notable and thoughtful contributions from Billy Bragg and Will Self on the implications of Scottish independence on governance and democracy south of the border. I tire of those (from both camps) who seek to silence people on the basis of residency or ethnicity. I don’t see Scots being told they can’t have opinions about Ukraine or Syria because they weren’t born there or don’t live there. It’s true that Sean Connery’s influence is undoubtedly weakened by the fact that he lives in the Bahamas, but few would argue that Florida resident Irvine Welsh does not have a strong voice in the independence debate. Welsh is still a frequent visitor to Scotland and is rooted in the working class cultures of football and boxing. He has a long-standing involvement in the debate and has written and talked widely on his views and how they were shaped by his own experiences. So while place of residence, in itself, does not matter; the level of connection and engagement with Scotland does influence the weight people will give to an opinion. So, like Ben Fogle, most non-Scots dipping their toes into the water feel obliged to offer their credentials before opining on independence. Independence-leaning celebrities Bill Baillie, Simon Pegg and Noel Gallagher, for example, have all identified connections through their wives or partners. He adds that: “I had spent an enjoyable week with a crew of Scots trawler men, during which we debated openly about the subject of independence versus union.” Titchmarsh states that: “I’ve a great love for Scotland and have spent lots of time there since going on regular holidays as a youngster.” Titchmarsh’s latest novel (I confess to having missed the others) Bring Me Home, is set in Scotland. It “tells of landowner Charlie Stuart’s battle to keep his castle and estate going”. Bowie’s intervention also scores poorly on the connection front. He was reportedly ‘too cool’ to come to the UK to make his statement in person and has no documented affinity with Scotland. Izzard (born in Yemen) has lived in practically every part of the UK, including Northern Ireland and Wales; but not in Scotland. He did, however, run from Edinburgh to the Border carrying a Saltire as part of his epic charity run. It might be reasonable to conclude that these viewpoints are rooted more in nostalgia and romanticism than the everyday lives of the contemporary Scottish voter. This perhaps explains the quasi-colonial message of loss and abandonment that they all deploy. Ben Fogle has made no secret of his (Tory) political ambitions, telling the Telegraph that: “Obviously, running London would be an amazing thing. I’m a Londoner, so who knows? I think Boris Johnson will probably be prime minister one day and when he steps aside, maybe I’ll nip in there.” So perhaps he has offered himself up as love-bombing cannon fodder with longer-term political ambitions in mind. 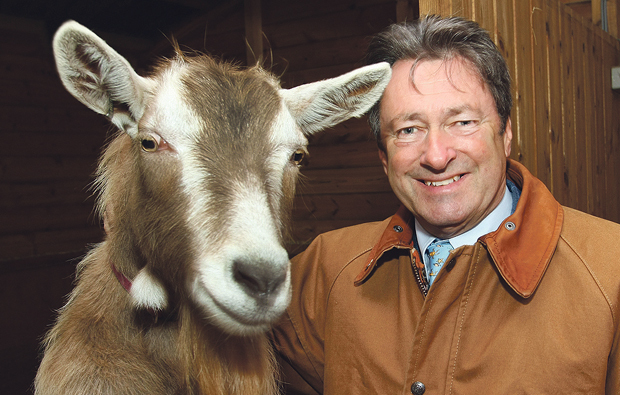 Titchmarsh has less of a political pedigree, however, his only previous dabble was stating in the Daily Mail that: “Gardening is more important than politics. It has a consistent point of view. And that is: that a piece of ground should be cherished.” So it doesn’t sound like his intervention is going to take roots. Eddie Izzard, in contrast, is something of a veteran when it comes to political campaigns. He is a well-known Labour supporter and funder, and was also a prominent backer of the doomed Alternative Vote referendum in 2011. In 2005 he campaigned for Britain to adopt the Euro and has traditionally adopted a pro-European and more progressive stance on many issues than the mainstream of his party. In 2011 he stated his ambition was to become an MP or MEP by 2020. While Izzard may also be keeping an eye on the longer-term political career, I find it less likely that he is a puppet of the Labour Party in this enterprise. And unlike the other three, Izzard appears to be prepared to take an ongoing role in the debate. So three of the four come from what appears to be a right-wing perspective, while two have recently-stated ambitions to become elected political representatives for the two major UK parties. So what are we to conclude from these interventions? They show little understanding of the referendum issues. They come from individuals with romantic and nostalgic views of Scotland. They come from people, mainly on the right, with little connection to Scotland. Two of them have recently-stated ambitions to become elected political representatives for the two major UK parties. I don’t think these interventions will have any major bearing on people’s voting intentions come September 18th. It remains to be seen what Eddie Izzard might add during his 4th April show. But based on his statements to date, he will need to do a lot of catching up if his intervention is going to seriously trouble those in the Yes camp. That’s not to say that celebrities can’t have an impact. But they need to demonstrate an understanding based on some meaningful connection to the debate, and they need to focus on the key issues rather than abstract romantic or emotional themes. You haven’t mentioned John Barrowman, the Krankies or Kermit? As you say, it depends on the level of involvement. Though I like Bowie, I don’t look to him for political guidance. Eddie Izzard, on the other hand, I think of as quite politically progressive, so I am disappointed to find him swallowing the Labour line as regards independence, and the personalisation of the debate around Alex Salmond. He also came here with Ed Miliband during the 2011 Holyrood campaign, when Red Ed told us that only Labour could protect us from the Tories. Since we all know the Tories are a rump party, that message was duly ignored, but Labour don’t seem to have learned anything from the experience, and still talk of how their share of the vote increased in 2010. Don’t forget Beaker’s already on board.Reading through the list of “Celebs” I wondered if Ant and Dec would pop out of the woodwork somewhere. Who the hell is Ben Fogle? I loved the photo of the two Donkeys. Eddie Izzard is politically active, donates and campaigns for the Labour Party as well as stating he would like to be a Labour politician seeking office by 2020. Apart from Eddie, the rest are emotional responses as if somehow their memories of, or future visits to, Scotland will be soiled by independence. ‘A lot of people in Tory England like the Scottish scenery but they don’t necessarily want the people that go with it.’ That was once said to me by a Yorkshireman who felt emotionally closer to Scotland than the SE England. If I paid any attention to any of them it would have to be Kermit. He is, after all, a real puppet. The rest are only acting like puppets. I am a YES but I think that criticism (and it has to be said – abuse) of folk from other parts of the UK is unfair. At this point in history and hopefully only until September 18th, we are all part of the UK. We are potentially going to leave the UK so this decision affects those who are left there. To me this gives them the right to hold an opinion about this and to express it. I don’t think they should not be abused for it. I don’t think they should be abused either and I don’t think they are being. But they are open to fair criticism. And the criticism about the terms and language they use is fair and even, in our opinion. Anyone and everyone has a right to their opinion wherever they live. Anyone whose intervention includes “oh I like to go on holiday in Scotland”, or words to that effect, can take a hike, quite frankly. We’re not their little holiday home, and unlike them, we have to actually live here and put up with the decisions that are detrimental to our communities. That goes doubly so if the person in question is a big posh sod with plums in his mouth. Bowie was the closest thing I ever got to religion. Adult analysis of my Pin up has been depressing. He is master of promotional controversial copy. The alladin sane cover, that is British Union of Facist sign on his face.